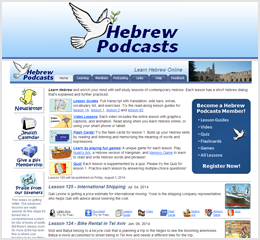 Hebrew Podcasts is a project launched in 2008 in the purpose of publishing Hebrew lessons in the form of podcasts. Nivi and Gadi Yedwab manage the project and combine their experience with the new software solutions in the purpose of creating unique lesson materials. They believe that the podcast format is an effective way for learning the language, as it enables students to learn from the real-life dialogs. The main part of the lesson is the podcast that brings the context of the lesson to the learners via interesting videos. Each lesson covers different topics in both audio and video format. In addition, the full transcript of each podcast is available in PDF format. The phrases in the Hebrew podcasts illustrate the language patterns, grammar rules, colloquial expressions, etc. The language used in the podcasts is contemporary Hebrew spoken in Israel with authentic Israeli accent. The dialog topics are suitable for the students of all ages. Besides the language, podcasts integrate topic related to Hebrew culture, which brings the authentic surrounding to the learners. 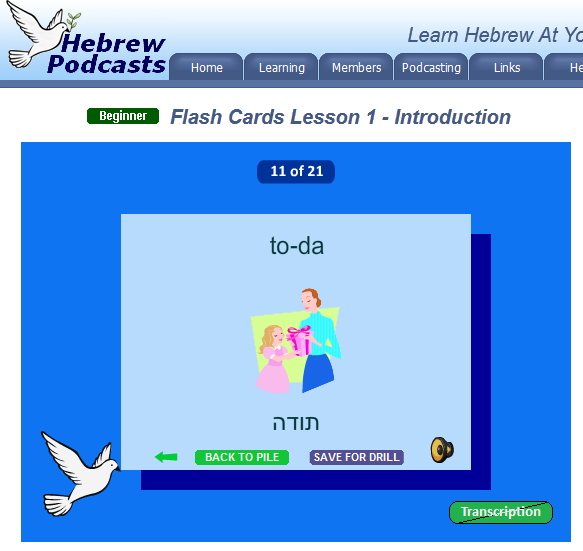 The lessons are divided according to the language level, so you can easily select the lessons suitable for your level of Hebrew. Before you decide which lesson to choose, it is recommended that you take a Hebrew skill test. 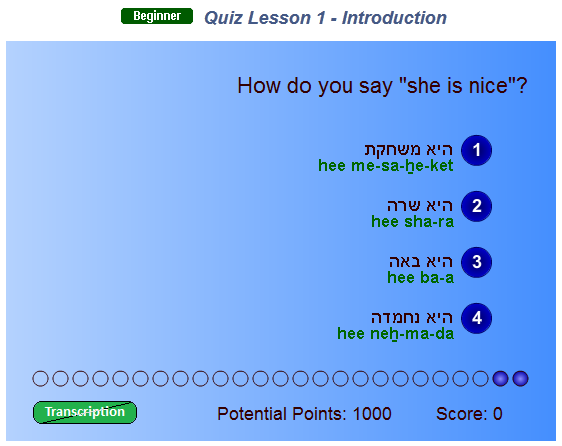 The goal of the test is to determine your level of Hebrew through multiple-choice questions. The test consists of two parts. Once you complete the test, you will receive an email with the test result and recommendation for further learning. Easy lessons – The focus of these lessons is basic vocabulary. They are good preparation for the dialogues you are going to hear as you go on with more advanced lessons. Beginner lessons – These lessons feature a short dialog, ranging from 40 to 60 words. The dialog is spoken much slower than usual, which enables you to hear all the words correctly and practice your pronunciation. The vocabulary is limited to the basic concepts such as introductions, daily life activities and similar. Intermediate lessons – These lessons feature dialog that usually contains between 50 and 100 words and these lessons cover a wider range of conversational topics. There are lots of new words and structures introduced, as well as idiomatic and colloquial expressions. The dialog is spoken faster than in the beginner lessons and it is similar to the speech rate of native speakers. Advanced lessons – In this section the lessons start to cover more advanced grammar and expressions. The dialog in these lessons contains around 100 to 250 words which are spoken at the same tempo in which a native speaker would do it in a casual conversation. Sentences are more complex, as the advanced level requires higher level of communication skills and proficiency. One new lesson is published every month. 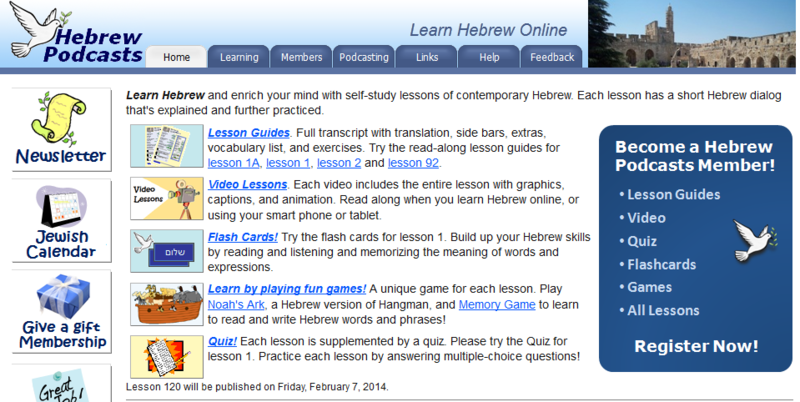 Currently, there are 119 Hebrew lessons available on the website. All of the lessons, except for the easy lessons, follow the same structure consisting of eight parts. Easy lessons are sort of “mini lessons” and they are created as an introduction for the following beginner lessons. Therefore, these lessons have only four parts, featuring a podcast without exercises. Listen now – In the first part you can listen to the lesson presentation using a short dialogue. The phrases, rules and patterns are also explained in the audio part. The teacher explains the topic, rules, and introduces the dialog. The teacher also repeats the Hebrew words and provides an English translation. Download – The second option enables you to download the audio part which is very convenient if you wish to listen to the lesson on the go, via a mobile device or MP3 player. Lesson guide – Lesson guide contains all the materials covered during the lesson. You get full transcript with translation, side bars, vocabulary list and exercises. Everything that is presented in the audio recording can be downloaded in PDF format as well. Video – The entire lesson is presented in video format with graphics, captions and animations. You can watch the videos on your computer or a mobile device. Video lesson features images, translation and transliteration. The videos can be downloaded in MP4 format. Flashcards – Flashcards are an excellent way to reinforce the vocabulary you have learned in the lesson. Members have the “Save for drill” button, which allows you to save certain cards from each lesson and use them on a later occasion when you wish to review the lesson materials. 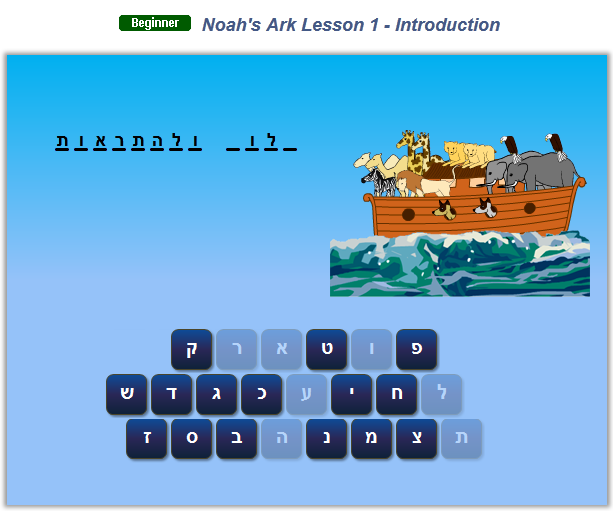 Noah’s Ark – This is an interesting game which helps you improve your writing skill by practicing phrases and words from the lesson. The goal is to fill in the missing letter in Hebrew phrases before Noah’s ark sinks. 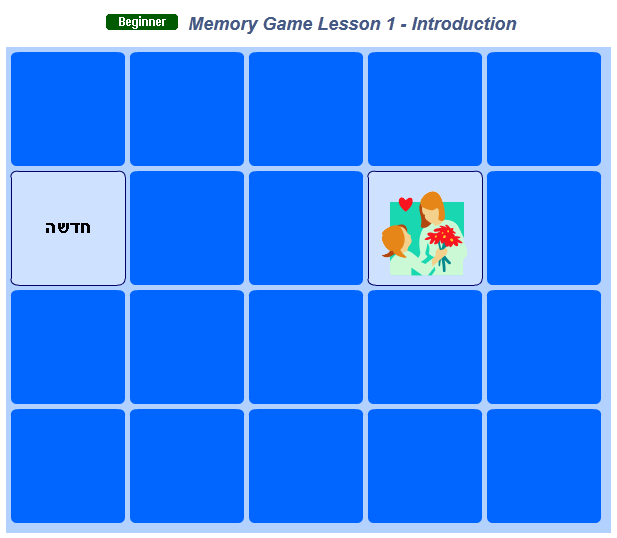 Memory game – Another game for reinforcing vocabulary is the Memory game. The goal is to match the Hebrew words with the correct image. Quiz – In the end of the lesson you have a quiz to take so you can check your progress. The quiz has multiple-choice questions and the time limit for each question. Once you complete the quiz you will see how well you are doing and if you should go back to the lesson to review certain parts. Easy lessons do not contain a practice section. There is only audio and video podcast available, with lesson guide containing all the materials presented in the podcasts. The lesson materials are suitable for students of all ages. Even though the lessons are not designed specifically for children, they might be interesting, especially the videos and the games in each lesson. Having in mind that lessons cover four levels, the lessons can be of great assistance to beginners as well as to advanced learners. 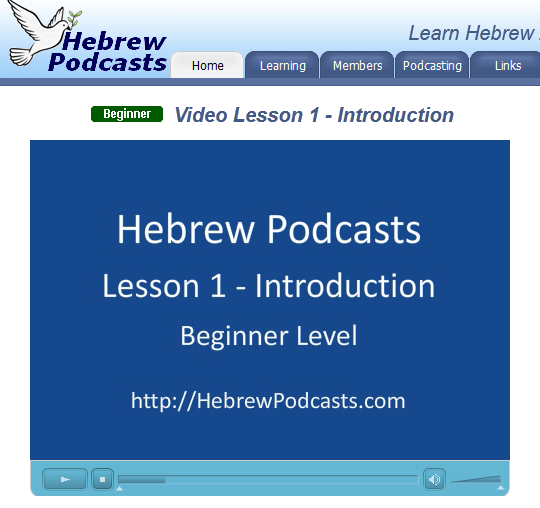 Hebrew Podcasts includes additional resources to help you learn more about Hebrew language and culture. All of these resources are free. Jewish Holiday Recipes and Crafts – Learn about important Jewish holidays and traditional food using this free resource page. The materials include historical background related to each Jewish holiday, recipes for traditional food prepared during certain holidays, and craft activities for children with detailed instructions. Jewish calendar – You can learn how date is calculated according to the Jewish calendar. Additionally, you will find out when important Jewish holidays are celebrated. Dictionaries – Having a Hebrew dictionary is extremely useful while learning Hebrew language. Hebrew Podcasts recommends some of the most useful English-Hebrew and Hebrew-English dictionaries. The list of dictionaries includes both online dictionaries and books. Newsletter – A great opportunity to learn about contemporary Hebrew expressions and greetings is to sign up for Hebrew Podcasts newsletter. By joining the mailing list, you will receive the newsletter several times during the year, with the information about Israeli culture and tradition, as well as ideas on how to improve your Hebrew. Once you subscribe to Hebrew Podcasts, you become a member with full access to all of the lessons available on the site. Since the lessons are divided into four parts, you should choose the lessons that are suitable for your level of Hebrew. In order to determine the level of Hebrew, you should take the test that is available at Hebrew Podcasts website. Not only will you get the results, but you will get a personalized recommendation in terms of where to start with learning Hebrew. Lesson 1 (Introduction) is a completely free lesson which you can take in order to see if these lessons can be helpful for learning Hebrew. Even though the lesson is from the beginners group, the lesson structure is the same in all the lessons regardless of the level. Free samples also include lesson guides for lesson 2 (Alphabet), a beginner lesson, and lesson 92 (Conference at King David Hotel), an advanced lesson. First five and the most recent five podcasts are also free. You can subscribe to Hebrew Podcasts by purchasing one of the three membership plans: 90-day membership costs $49, 6-month membership costs $59 and 1-year membership costs $79. Once your membership expires, you can renew it at lower price rates: $16 for 60 days, $40 for 6 months and $69 for one year. After two years paying membership at Hebrew Podcasts you become a Distinguished Member and you will be able to purchase yearly membership for $59. The payments are conducted via Amazon or PayPal. Hebrew Podcast offers 60-day money back guarantee. You can learn at your own pace and go back to any part of the lesson to review. There is no possibility to practice speaking. It is not possible for students to communicate with each other and exchange experience. The lessons are not sorted in any particular order. Some students may find it difficult to determine on their own from which lesson should they start. There is no feedback from the teacher. One-on-one private lessons are not available. • Which devices can I use to listen to Hebrew podcasts? You can use iPod, iPhone, iPad, any mobile device or music player. Any device supporting MP3 and MP4 files will be able to play the podcasts. • How do I download podcasts? You can download the podcasts by subscribing to podcasts on iTunes. Another way to download the podcasts is to use “Download” button in each lesson to save the file to your computer. 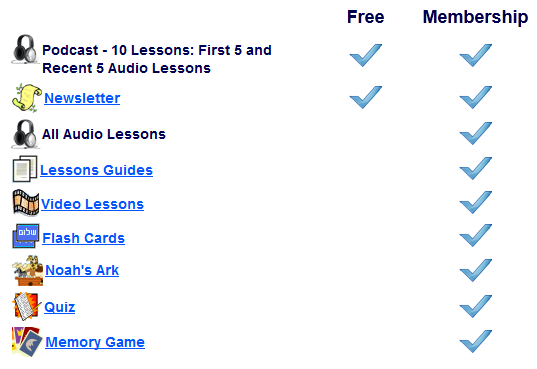 Members can download podcasts from all the lessons, including both audio and video materials. They will be able to download file as zip archive. • How can I find the answers to the exercises? All the answers are provided on the “Answer page” which is available to members of Hebrew Podcasts. If you seek a learning program that enables you to learn at your own pace and from anywhere you are, Hebrew Podcasts is a perfect choice for you. The unique structure of the lessons including podcasts and effective exercise for reinforcement of vocabulary and grammar is something which distinguishes this learning method from all the others. The lessons follow a structure that gradually introduces the new information through interactive dialogs. Both Hebrew and English are used in the lesson podcasts in order to establish connections between the two languages and to learn by the method of comparison. As a member of Hebrew Podcasts you get access to all the lesson materials which are available online or as a download for use on your computer or a mobile device.